While analyzing your website to understand why visitors aren’t taking an action that you want them to, you make a few observations. 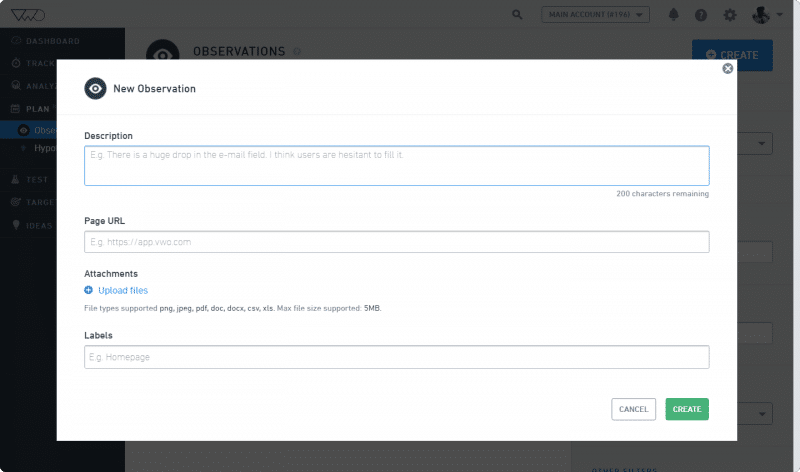 VWO lets you record all your observations. You can create an observation from the Plan section of the VWO app or from the reports of the different campaigns under the Analyze section. On the navigation bar, click Observations under Plan. In the upper right corner of the Observations screen, click the Create button. The New Observation pop-up appears. On this pop-up, enter the observation details in the respective fields. Description: Explain your observation here. Page URL: Enter the URL of the page where you made the observation. Labels: Enter labels to make this Observation easily searchable. Click Create to finalize the Observation. As stated earlier, you can also create observation from the Analyze section of the app. To know more about it, click here.